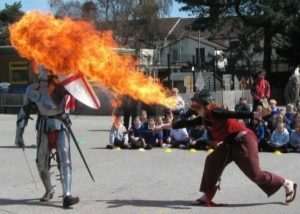 Black Knight brings St George to life! Every year we celebrate our patron saint on 23rd April, and we offer a number of activities suitable for this purpose. Our most perfect act for this special day is St George himself, clad in finest 15th century style armour, riding a white horse. Perfect for pageants and parades. We can also provide storytellers, puppet shows, and a 4 person act with narrator, firebreathing dragon and beautiful maiden tied to a stake! I’m sure you can guess who turns up to save the princess? Contact us for a friendly, no-obligation chat about your venue and how we can assist in bringing our patron saint to life for you. ‘The legend of St George’ is another of our historical lecture series, and looks at his history from Roman times through to his ascendency in the Middle Ages, and his iconic persona to the modern day. Saint George. [Born Cappadocia, circa 270 AD. Died circa 303 AD]. Martyr, Patron Saint of England. I quote” He suffered at Lydda [Diospolis] in Palestine, where his tomb was shown. It is likely that he was a soldier. Cult was both ancient and widespread- Feasts celebrated in the East named him ‘megalomartyros’. In the west he is named in the Martyrology of Jerome, and the Gregorian Sacramentry. The record & cult of St George considerably precede the ‘Acts’ with surviving texts in Greek, Latin, Armenian, Coptic, Syriac, Ethiopian and Turkish. An apocryphal Passion of St George existed and is mentioned by Pope Gelasius [492-496]. The famous story of St George & the Dragon is by no means primitive; becoming popular in thw west through ‘The Golden Legend’, translated and printed by William Caxton in the late 15th century. The story needs no retelling here – apart from the conclusion – ‘if the people will believe in Jesus Christ, then St. George gets rid of the monster. The King & his people agreed, 13,000 were baptised and the Dragon was slain. George, the apogee of chivalry, would take no reward, but ‘told’ the king to maintain churches, honour priests and show compassion to the poor. The legend continues with the marvelous account of the suffering and death of our hero- under Diocletian and Maximian. [possibly the only true part of this story]. George has been known in England since the 7th century, evidenced by the Martyrology of Bede, works of Ælfric and the OE Martyrology. The cult was (naturally) developed during the Crusades. Visions of George and St. Demetrius are recorded at the siege of Antioch in 1098. The author of the Gesta Francorum claimed that George’s body was laid in a church near Ramleh. Richard I placed his crusading army under the protection of the Saint, and he was revered as Patron of soldiers. English ecclesiastics & Bishops made his feast into a lesser holiday in 1222 at the Synod of Oxford. He really gets elevated in the 1340’s when King Edward III founds the Order of the Garter under his patronage, and building the chapel of St George at Windsor is continued by Edward IV and Henry VII. After Agincourt in 1415 his feast is elevated to a Principal Feast of the Holy Year by Archbishop Chiclele. For those interested in rival claimants to the throne of ‘England’s Patron Saint’ -Edward the Confessor and Edmund of EA were still celebrated during the 15th Century, George is venerated not only here, but in Venice, Genoa, Portugal and Catalonia as the personification of Christian chivalry. In Germany he is numbered among the 14 Holy Helpers. Hagiography – with thanks to the ‘Oxford Dictionary of Saints’.